Our world seems to grow smaller by the day as biodiversity rapidly dwindles, but Mother Earth still has a surprise or two up her sleeve. An international team of researchers were the first to investigate a never before studied species—a giant, black, mud dwelling, worm-like animal. The odd animal doesn't seem to eat much, instead it gets its energy from a form of sulfur. The findings, led by scientists at the University of Utah, Northeastern University, University of the Philippines, Sultan Kudarat State University and Drexel University, will be published online in the Apr. 17 issue of the Proceedings of the National Academy of Sciences. People have known about the existence of the creature for centuries. The three- to five-foot long, tusk-like shells that encase the animal were first documented in the 18th century. "The shells are fairly common," begins lead investigator Daniel Distel, Ph.D., a research professor and director of the Ocean Genome Legacy Center at Northeastern University, "But we have never had access to the animal living inside." The animal's preferred habitat was unclear, but the research team benefitted from a bit of serendipity when one of their collaborators shared a documentary that aired on Philippine television. The video showed the bizarre creatures planted, like carrots, in the mud of a shallow lagoon. Following this lead, the scientists set up an expedition and found live specimens of Kuphus polythalamia. With a live giant shipworm finally in hand, the research team huddled around Distel as he carefully washed the sticky mud caked to the outside of the giant shipworm shell and tapped off the outer cap, revealing the creature living inside. "I was awestruck when I first saw the sheer immensity of this bizarre animal," says Marvin Altamia, researcher at the marine sciences institute, University of the Philippines. "Being present for the first encounter of an animal like this is the closest I will ever get to being a 19th century naturalist," says the study's senior author Margo Haygood, a research professor in medicinal chemistry at the University of Utah College of Pharmacy. Because the animal had never been studied rigorously, little was known about its life history, habitat, or biology. 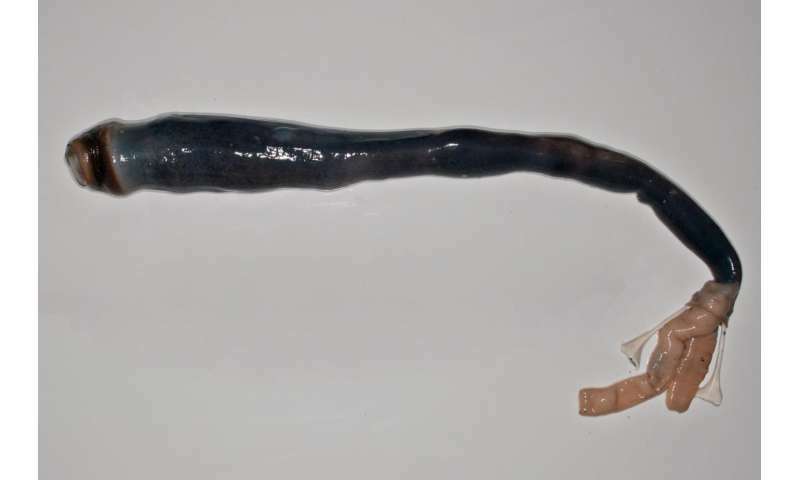 "We suspected the giant shipworm was radically different from other wood-eating shipworms," says Haygood. "Finding the animal confirmed that." Altamia continues, "Frankly, I was nervous. If we made a mistake, we could lose the opportunity to discover the secrets of this very rare specimen." The scientists were then faced with an interesting dilemma explain why Kuphus is so unusual. The answer may lie in the remote habitat in which it was found, a lagoon laden with rotting wood. 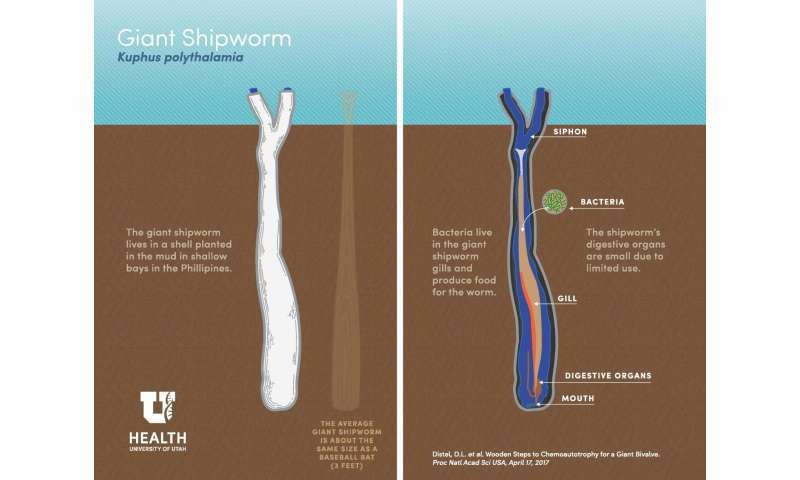 The normal shipworm burrows deep into the wood of trees that have washed into the ocean, munching on and digesting the wood with the help of bacteria. Unlike its shipworm cousins, Kuphus lives in the mud. It also turns to bacteria to obtain nourishment, but in a different way. Kuphus lives in a pretty stinky place. The organic-rich mud around its habitat emits hydrogen sulfide, a gas derived from sulfur, which has a distinct rotten egg odor. This environment may be noxious for you and me, but it is a feast for the giant shipworm. And yet Kuphus themselves don't eat, or if they do, they eat very little. Instead, they rely on beneficial bacteria that live in their gills that make food for them. Like tiny chefs, these bacteria use the hydrogen sulfide as energy to produce organic carbon that feeds the shipworm. This process is similar to the way green plants use the sun's energy to convert carbon dioxide in the air into simple carbon compounds during photosynthesis. As a result, many of Kuphus's internal digestive organs have shrunk from lack of use. 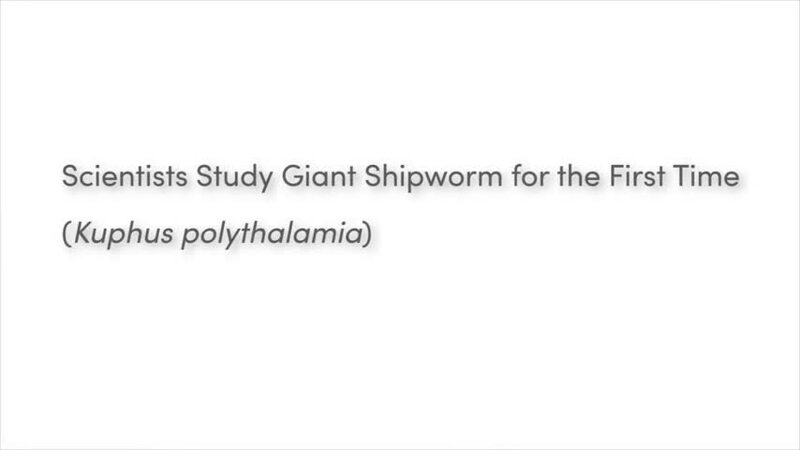 The giant shipworm's lifestyle lends support to a hypothesis proposed by Distel almost two decades ago. Acquiring a different type of beneficial bacteria could explain how shipworms transition from a wood-eating organism to one that uses a noxious gas in mud to survive. 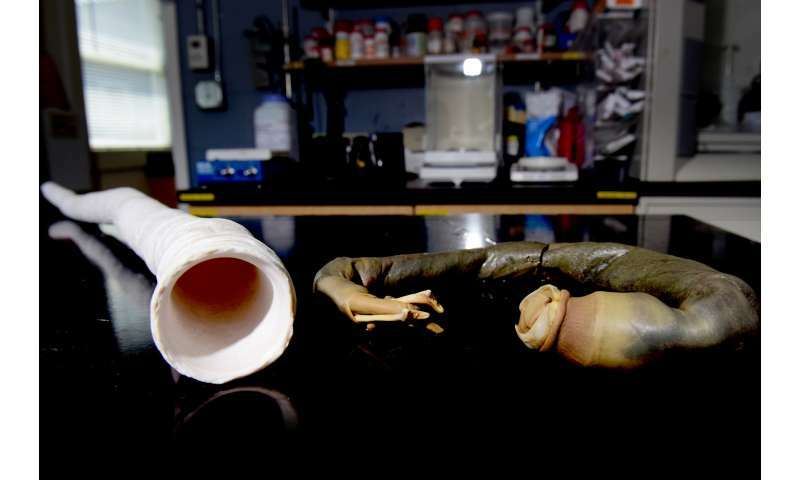 The research team will continue to examine the role wood plays in the unique transition between the normal shipworm and the giant shipworm. "We are also interested to see if similar transitions can be found for other animals that live in unique habitats around the world," said Distel. The discovery of this flagship creature expands on our understanding of biodiversity in the Indo-Pacific region, which was made possible through collaborative nature of this interdisciplinary, international research group. maybe they're a right laugh at parties? Its a sign of lower life form not to recognize the higher principle of a thing. These creatures clean the water, as biodiversity declines, the water turns murky and accumulates waste.